DNA is a molecule in humans that encodes genetic information in the sequence of its nucleotides. The ability to read this sequence quickly, reliably and at a low cost is the first step towards personalized medicine. Unfortunately, currently employed methods for reading the DNA sequence have various drawbacks, such as being too expensive or taking too much time. Nanometer-scale holes in synthetic membranes, or simply solid-state nanopores, have emerged as a promising platform for single-molecule studies. 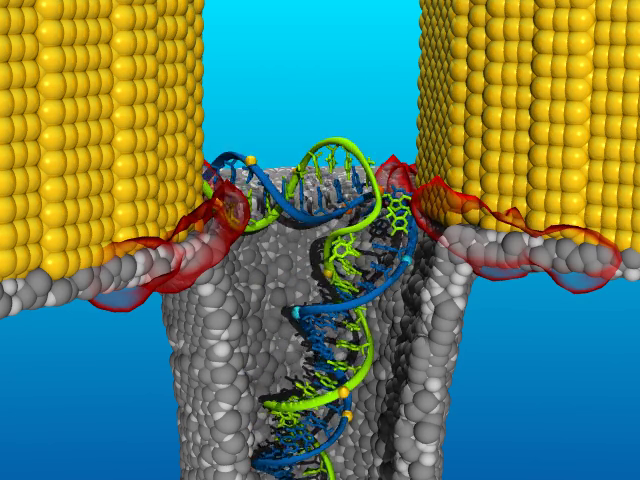 In a typical setup, a membrane with a nanopore is placed in a solution and an applied electric bias drives charged molecules such as DNA and ions through the hole. The idea of the nanopore-based DNA sequencing method is to read the sequence of nucleotides in a molecule as it moves through the pore. Typically employed ionic current measurements are, however, not sensitive enough to detect the minute differences in the organization of atoms in the nucleotides. 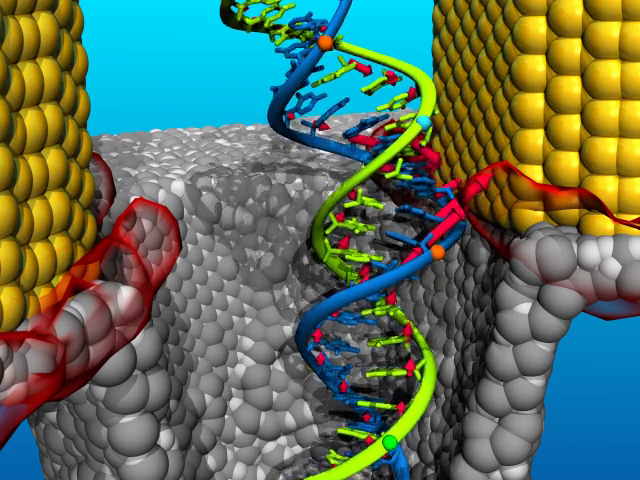 Moreover, fast DNA motion through synthetic nanopores makes it difficult to obtain clear signals needed to extract the information about DNA sequence. Plasmonic nanopores engage nanoplasmonics to control the electrophoretic motion of DNA through the pore as well as read the sequence of nucleotides by greatly enhancing the Raman spectroscopy signals. In our study we employ computational methods to investigate how solid-state nanopores, plasmon resonance, and surface enhanced Raman spectroscopy can work together making fast, cheap, and reliable DNA sequencing a reality. With the aim of developing a DNA sequencing methodology, we theoretically examine the feasibility of using nanoplasmonics to control the translocation of a DNA molecule through a solid-state nanopore and to read off sequence information using surface-enhanced Raman spectroscopy. 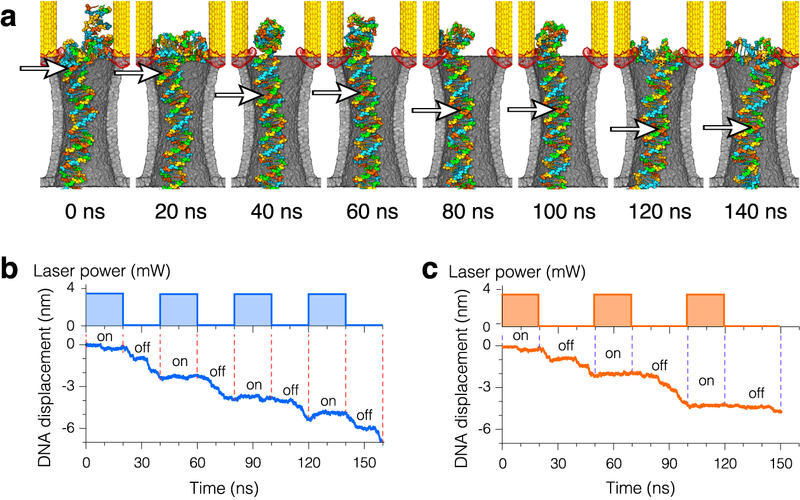 Using molecular dynamics simulations, we show that high-intensity optical hot spots produced by a metallic nanostructure can arrest DNA translocation through a solid-state nanopore, thus providing a physical knob for controlling the DNA speed. Switching the plasmonic field on and off can displace the DNA molecule in discrete steps, sequentially exposing neighboring fragments of a DNA molecule to the pore as well as to the plasmonic hot spot. 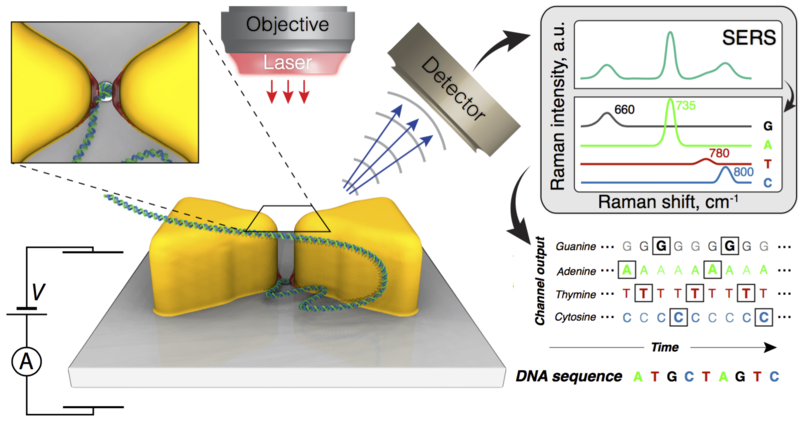 Surface-enhanced Raman scattering from the exposed DNA fragments contains information about their nucleotide composition, possibly allowing the identification of the nucleotide sequence of a DNA molecule transported through the hot spot. The principles of plasmonic nanopore sequencing can be extended to detection of DNA modifications and RNA characterization. 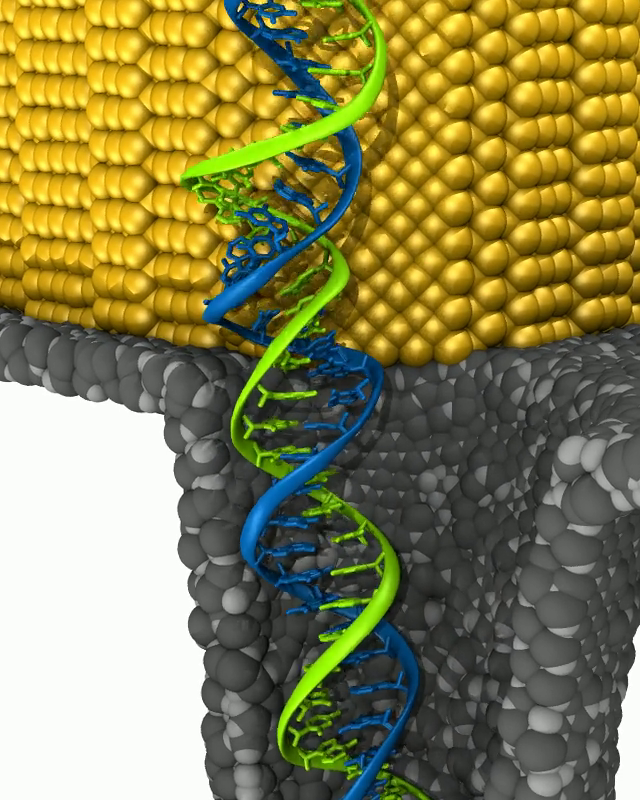 Trapping of a double-stranded DNA by one of the plasmonic hot spots near the gold bow tie structure. Such a trapping regime is characteristic for low powers of the incident laser irradiation. Arrows illustrate forces exerted by the plasmonic fields on the bases of the DNA molecule moving through the plasmonic nanopore structure. Trapping of a double-stranded DNA characteristic for strong plasmonic field strengths. Such plasmonic fields are generated by the bow tie structure when the magnitude of the indicent laser irradiation is high. Arrows illustrate forces exerted by the plasmonic fields on the bases of the DNA molecule moving through the plasmonic nanopore structure. In such a trapping regime, two regions of a double-stranded DNA molecule contribute to the surface-enhanced Raman spectroscopy signal. Since plasmonic hot spots can trap different strands of the molecule, this regime is not favorable for DNA sequencing applications. Plasmonic control of electrophoretic DNA motion through the plasmonic nanopore. 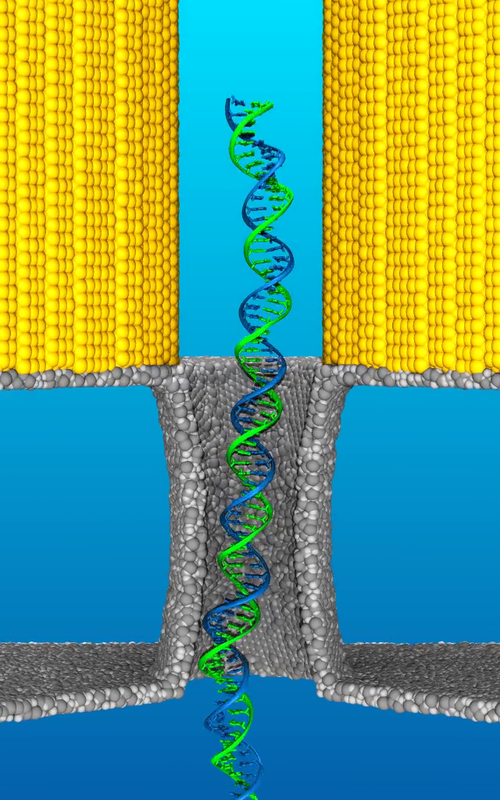 The electric field is constantly pulling the DNA molecule across the membrane and through the nanopore. Plasmonic fields are modulated by switching the incident laser on and off. When the laser is turned on, plasmonic fields trap the molecule and halt its translocation through the pore. When the laser is switched off, DNA leaves the plasmonic hot spots and translocates further through the pore. In this video duration of each (trapping and release) phase is 20 ns for a total period of modulation cycle of 40 ns. The plasmonic field strength corresponds to a 3.7 mW incident laser beam. Step-wise motion of DNA through plasmonic nanopores induced by periodic modulation of the incident laser radiation. Trapping of a double-stranded DNA molecule in an "asymmetric" plasmonic nanopore in which the strength of one of the plasmonic hot spots is signiticantly lowered (in simulations the second plasmonic hot spot was suppressed completely). 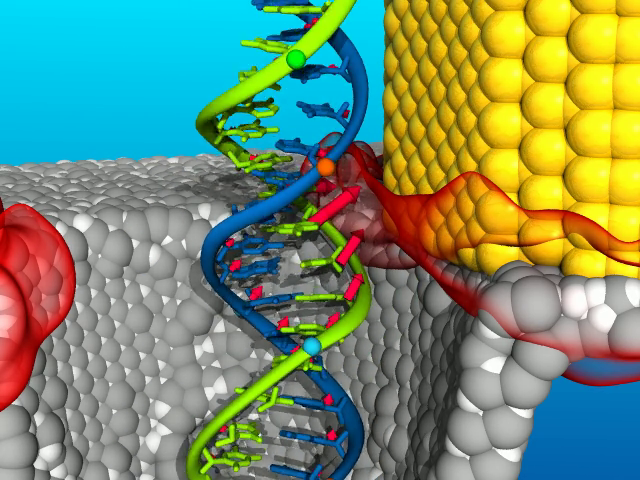 The plasmonic hot spot that traps the DNA is not shown for clarity. A 500-mV applied transmembrane bias pulls the molecule through the pore. The plasmonic field strength corresponds to a 7.4 mW incident laser beam. Trapping of a double-stranded DNA molecule in an "asymmetric" plasmonic nanopore in which the strength of one of the plasmonic hot spots is signiticantly lowered (in simulations the second plasmonic hot spot was suppressed completely). 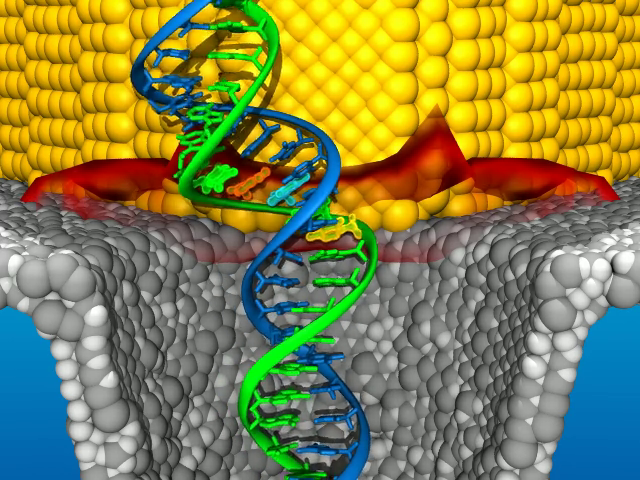 The plasmonic hot spot that traps the DNA is not shown for clarity. A 350-mV applied transmembrane bias pulls the molecule through the pore. The plasmonic field strength corresponds to a 5.2 mW incident laser beam. 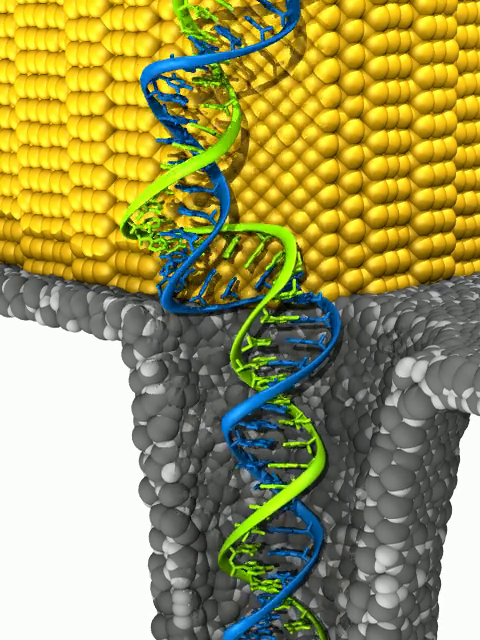 Illustration of the method for sequencing single-stranded DNA molecules in plasmonic nanopores. The molecule is captured by the optical fields emerging in the device when it is illuminated by an incident laser radiation. An applied electric bias pulls the molecule through the pore (down in the figure) while the untranslocated DNA tail (not shown) creates tension and prevents secondary structure formation. Surface-enhanced Raman spectroscopy (SERS) identifies the composition of nucleotides in the plasmonic hot spots. Analysis of the SERS trace signals reports the sequence of nucleotides in the molecule. Overview of the proposed method for sequencing DNA in solid-state nanopores. The molecule is pulled to and through the pore by applying a transmembrane electric bias. Incident laser radiation excites plasmonic hot spots that attract the molecule and, ultimately, halt its translocation through the pore. The high intensity optical fields increase the Raman scattering signal which reports the identity of nucleotides of the DNA molecule.